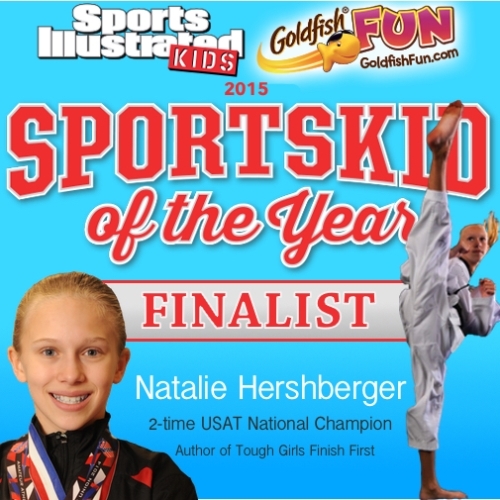 (October 8, 2015) -- Forgive 11-year-old Natalie Hershberger for initially not knowing what to make of being named one of five finalists for this year's Sports Illustrated Kids SportsKid of the Year. She's been too busy winning national championships, writing books and doing speaking engagements. However, the annual award, based on three areas -- academics, athletics, and community involvement -- is indeed prestigious. Last year's winner was Little League phenom Mo'ne Davis. "I didn't know a lot about the award," admitted Hershberger. "I looked it up after being nominated and I was so excited to be honored among so many great athletes from other sports. I'm so thankful to God for giving me this opportunity because it will give me even more chances to inspire and help others." As a finalist, Hershberger will be featured in the December issue of SI Kids Magazine. The overall winner will land on the cover of the January issue and be presented with the award at an official ceremony in New York City along with the adult Sports Illustrated Athlete of the Year. An A-student in 6th grade at Malabar Intermediate School in her hometown of Mansfield, Ohio, Hershberger won gold in her black belt division this year at the U.S. Open, the USA Taekwondo National Championships, the AAU Taekwondo National Championships, and the Pan American Taekwondo Youth Opens, outscoring opponents at these events 198–42. It helps that taekwondo is in her DNA. "I'm lucky to be part of a taekwondo family," says Hershberger. "My dad has been teaching taekwondo and kickboxing for over 20 years. All of my friends were doing ballet or gymnastics. I tried those and they were fun, but I just love to kick! In our family, getting a black belt in taekwondo is mandatory. Sort of like the Boy Scouts or Girl Scouts in other families. We do not have to compete though. I fell in love with Olympic taekwondo at 6-years-old." And the sport has certainly given back to Hershberger. "I love that it makes me feel confident in all the things I do," she said. "I also cherish the friendships I've made. Some of my closest friends live all over the country because of taekwondo." Outside of the dojang, Hershberger exemplifies the well-rounded life that the SportsKid of the Year Award is all about. Since last winter, she has sold more than 1,000 copies of the inspirational book "Tough Girls Finish First" which she self-published in part to help pay for training. She proved to be a natural in putting pen to paper. "I love to write," she said. "I asked my Dad why I couldn't write a book and sell it to my friends to help with competition expenses. Our sport is expensive so I was able to do two things I really enjoy. It took me about three months to write it. I've sold almost 2,000 copies to date. I had no idea I would be able to inspire so many other people to dream big." In addition to teaching free youth martial arts classes, Hershberger gives back to her community by speaking to Girl Scout troops, athletic clubs, and community organizations about the importance of hard work and following your dreams. What makes this all the more admirable is the fact that speaking in public puts this 11-year-old whiz kid out of her comfort zone. "This has been the hardest for me," admits Hershberger. "Demonstrating taekwondo is easy. Talking in front of hundreds of people is NOT. I feel like I'm getting better each time. I have done about 10 presentations to Girl Scout troops, entire schools, girls clubs, community organizations, and sports teams. Knowing that I can share my experience and inspire someone else is the easiest way I can think of helping people. I love to help people. I learned this from my grandpa. He would help anyone who needed anything." In the coming years, Hershberger has planned a clear road map for herself in the sport of taekwondo. "I set many short-term and long-term goals. I was bummed not to be old enough to qualify for the recent Cadet World Championships. It was nice to see many of my taekwondo friends compete in Korea. My dad told me there probably won't be another until 2017 because of the Olympics. I want to win Cadet Worlds, Junior Worlds, the Youth Olympics, and of course my ultimate goal of winning Olympic gold! I'm also working on another book and starting a YouTube weekly series to promote taekwondo." And what would she do if she won the SportsKid of the Year Award? "The award will allow me to continue being an ambassador for our amazing sport," she said. "If I win, I'll probably cry, a lot! The trip to New York City would be awesome too!" Wise and accomplished beyond her years, it's easy to forget Natalie Hershberger is still a pre-teen, until she offers up this confession. "Eating ice cream every other day is a dream of mine." USA Taekwondo sends Natalie our support and best wishes in the SportsKid of the Year contest and in all her future endeavors. Good luck Natalie! Voting for SportsKid of the Year runs thru noon on Oct. 13. To vote for Natalie and see the other finalists go to http://www.sikids.com/skoty.